He is the one who stood behind the greatest concerts in Israel and the world. Her has directed and taught chazzanim and is considered the encyclopedia of the world of Chazzanus. 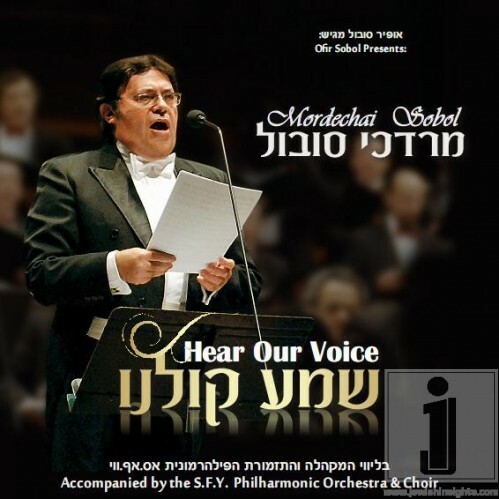 Dr. Mordechai Sobel is answering his students requests as well as the requests of the great cantors throughout the world, who have had a taste of his talent, by releasing an album on chazzanus. Sobel began singing at age 5. He is continuiing the legacy of music that has been part of his family for generations. His grandfather, R’ Aryeh Leib Sobel, was a famous cantor. This line of work has woven itself throughout the family. Sobel’s parents took his dream and turned it into a reality. Sobel was a child of the ’60s and was known in his youth as the ‘young cantor’ and wonderchild. He looked up to Cantor Shlomo Ravitz and Cantor Yitzchak Eshel. Others he used to listen to were Martin White, Shmuel Rivlin, Moshe Koussevitsky, and Mordechai Hershman. As he grew older, he realized where Chazzanus was headed so he decided to do something about it. He created the piece entitled “Yovel”. Since 1986, there have been hundreds of concerts of this nature. The revival of Chazzanus in Israel and worldwide can greatly be attributed to his concerts. Slow;y but surely the crown of chazzanus is being restored. Many students are becoming more interested in studying chazzanus. The world of Chazzanus becomes extremely proud when they hear a new talent in their field of music. Throughout the years, Mordechai Sobel has never stopped singing. He has mentored seasoned Chazzanim as well as those just starting out on their musical career. His latest album is entitled “Shema Koleinu”. Sobel feels that he has finally come full circle. He has been in the music industry for so many years and now on this CD he actually does some duets with himself from when he was 12 years old. Click PLAY below to hear some samples of this exciting new cd.